Take a closer look at the Beauty and the Beast Kingdom in Disney Hidden Worlds. Belle and Beast are profiled on House Hunters International. Which castle will they choose? How Well Do You Know Beauty & the Beast? Looking note perfect in her elegant winter cape, Belle performs <i>Something There</i> from <i>Beauty and the Beast</i> when you twist her wrist. Her name means ''beauty'' and this singing doll has no parallel. They'll safely celebrate their royal status in this Disney Princess helmet for toddlers. Featuring colorful screen art of Belle and Rapunzel plus six vents for ample airflow, they'll be protected in regal style. Costumed in her provincial villager dress, bookish plush Belle is depicted in her early years, as inspired by our Disney Animators' Collection toddler dolls. No one bulks up the fun like our Gaston Classic Doll. Belle's burly admirer from <i>Beauty and the Beast</i> is a tower of strength and ego in his huntsman tunic and boots. 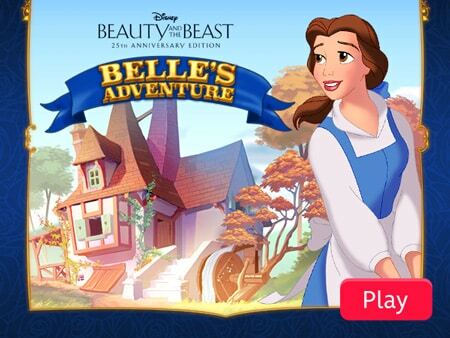 Relive a tale as old as time with our Beast Classic Doll. With a heart of gold and shimmering satin cape, it's easy to see why Belle was so enchanted in <i>Beauty and the Beast</i>.